Oct. 12, 2017 2:37 p.m. The Independent Investigations Office of B.C. 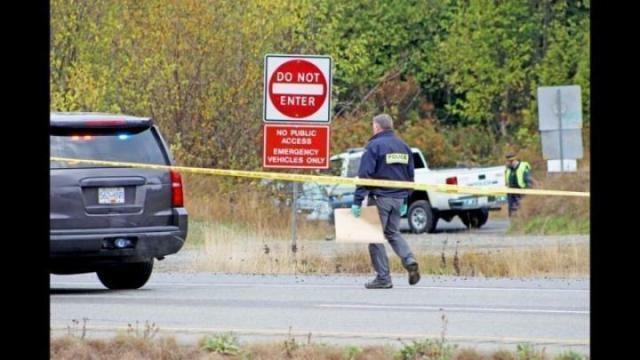 is investigating an officer involved shooting that left one man dead near Qualicum Beach. Oceanside RCMP were asked to assist Emergency Health Services (EHS) at 6 a.m. Thursday morning in responding to a complaint of a man who had stabbed himself inside a vehicle in the 39000-block of Highway 19, according to an RCMP press release(Oct. 12). When they arrived, a struggle ensued and at least one shot was fired by police, according to the the release. EHS immediately attended the scene, but the 35-year-old man succumbed to his injuries. Two police officers were transported to hospital with minor injuries. Police remained at the scene and cordoned off the area just before the Corcan Road overpass. Traffic flow on the highway had been reduced to single lane. A section of road used as access for emergency vehicles, connecting the highway to Nahmint Road which runs parallel to Highway 19, was also closed off. A marked RCMP pickup truck was parked next to a sedan on the access road. No further information is expected to be released by police. Anyone who witnessed the incident is asked to contact the IIO BC at 1-855-446-8477.